Terri Windling is one of my favorite writers and one of my favorite people in general (if she is a person, which I have long doubted – I suspect she’s really the Fairy Queen in her mortal form). She has the most wonderful blog, and as soon as you look at it, you will realize that I stole the idea of William Morris wallpaper (get it? wallpaper!) from her, although mine is a sort of sage rather than taupe. Well, Terri has a wonderful series on the blog, in which she is asking people to photograph their desks and posting the photographs. If you scroll down this post, you will see my desk. These are two of my shelves, and you can see how messy they are. On top I have notebooks with stories I’m working on, and a picture I haven’t yet hung up. That small black box is filled with contact information for people I know in the writing world, people I’ve met at conventions, etc. It’s my box of professional contact information. I suggest that every writer have one. 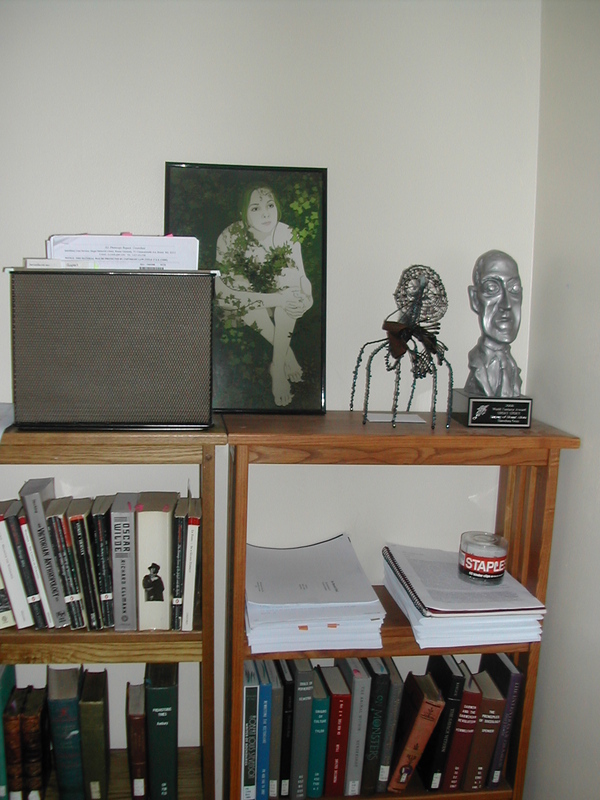 Two more of my bookshelves, with Mr. Lovecraft Head (yes, that’s my World Fantasy Award) and one of the most wonderful presents anyone has ever given me, the poet Elah Gal from “Child-Empress of Mars” sculpted by C. Jane Washburn. Also another picture (a digital one) I have not yet hung up. 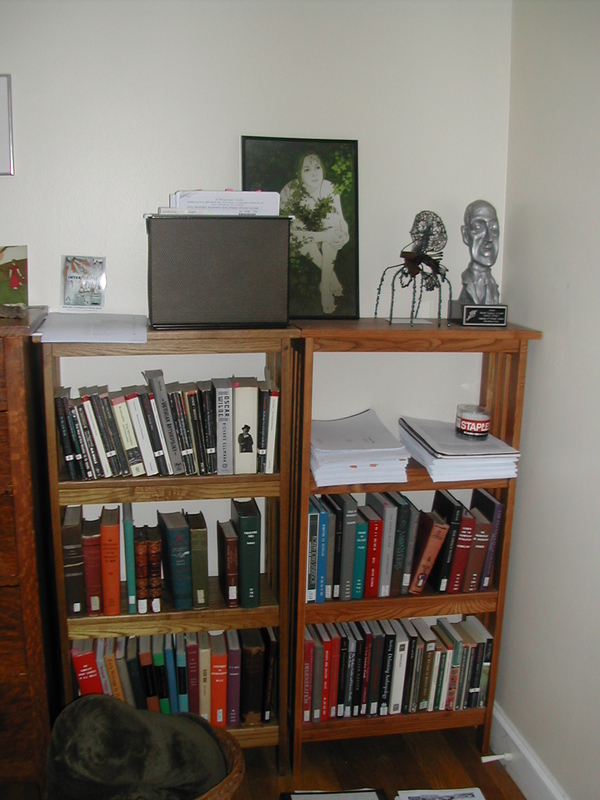 And another view of the same shelves, showing the all-important basket with a fuzzy blanket in it, which I wrap around myself when I’m reading. 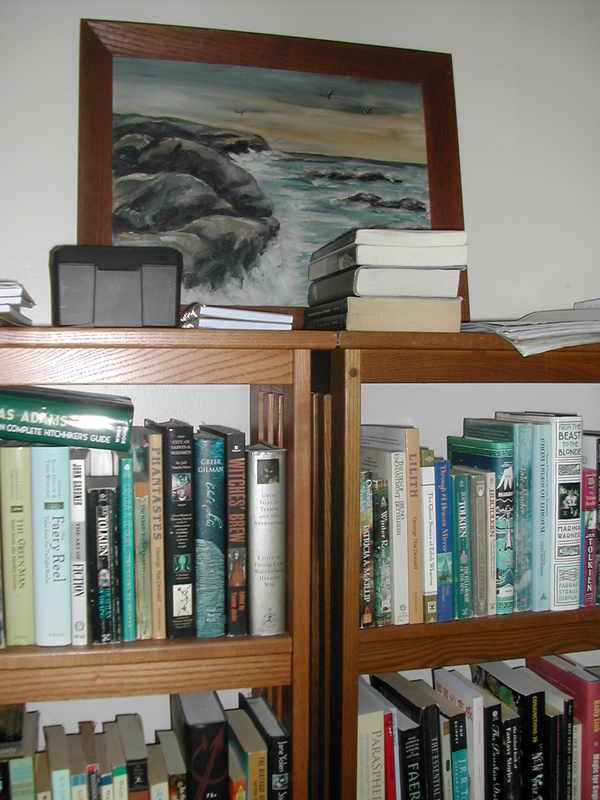 These shelves, by the way, are currently my dissertation shelves, meaning that they are filled with library books and copies of my manuscript. May they someday be put to a nobler use! 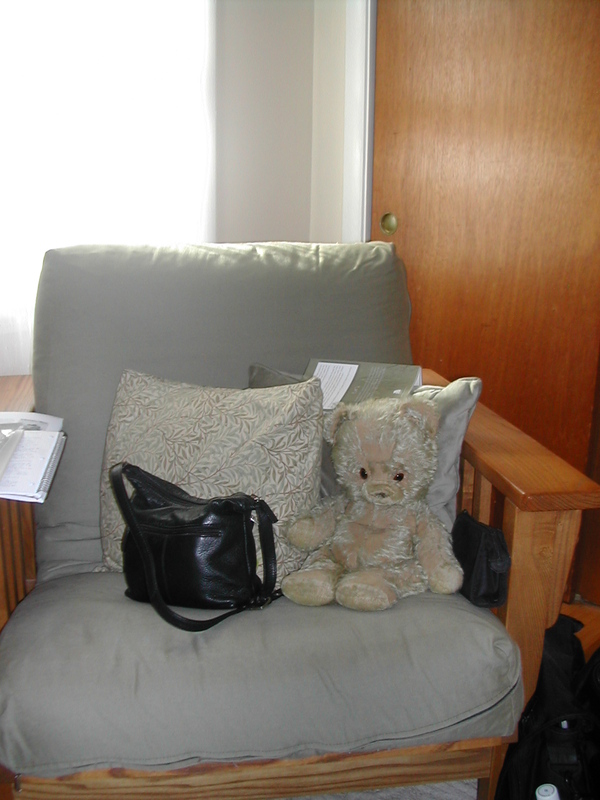 This is the comfortable chair, with Dani, the bear I received for my first Christmas, and a pillow I sewed from William Morris fabric (can you see a theme emerging? ), and my purse. (No, I did not straighten anything before taking these pictures. Perhaps I should have.) The book on the pillow is Kage Baker’s The Hotel Under the Sand, which I am currently reading. The books on the arm of the chair are a set of John Carter of Mars novels, which I’m using to research a story I’m currently writing, on top of the notebooks in which I’m writing the story. 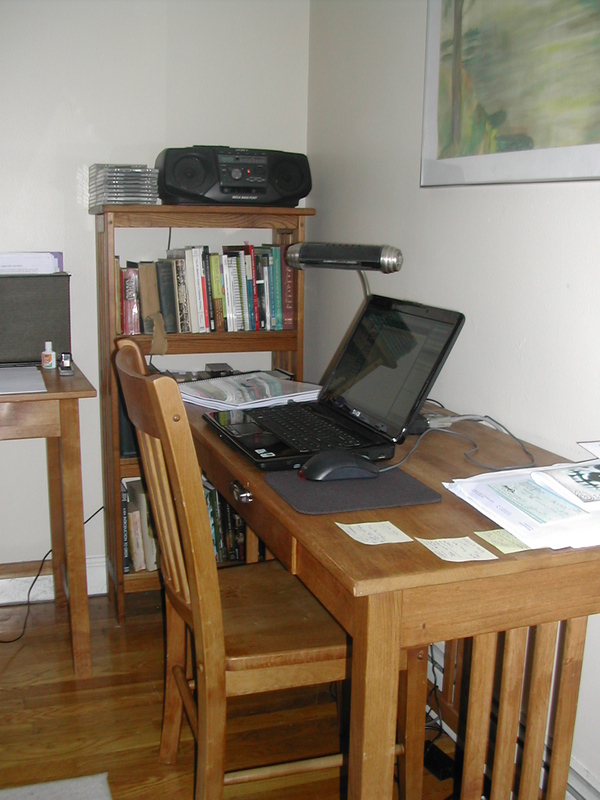 This is my desk, which was also shown on Terri’s blog. The CDs stacked on the shelf, by the ancient boombox I salvaged from the basement of the apartment building where I used to live, are mostly Loreena McKennitt, music from the Renaissance, or experimental modern music (Eric Satie, Arvo Pärt, Morton Feldman). And panning over, you get to . . .
My other desk, where I do anything that does not require a computer. 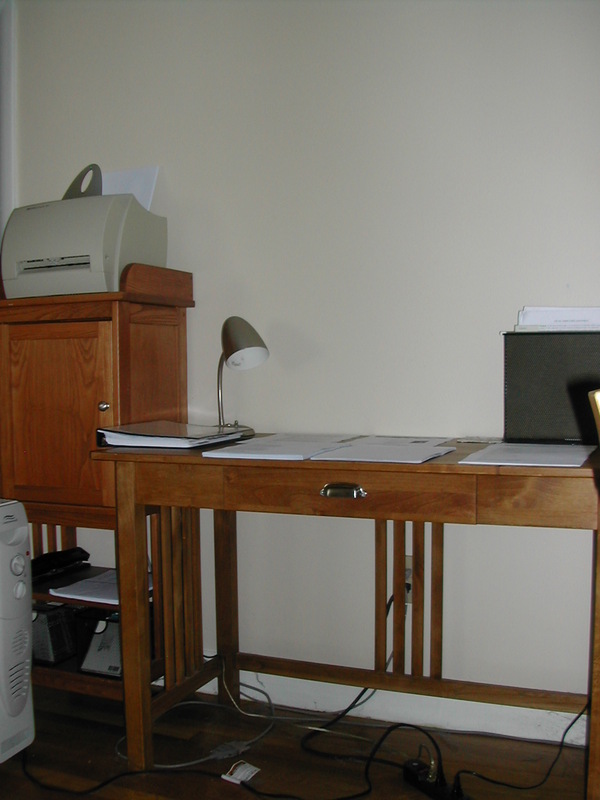 The cabinet holds writing supplies, and in front of it is my new favorite thing in the world, my space heater. Because in a drafty old house in Massachusetts, it is never, ever warm enough. And there you have it, my work space. If I owned this house, it would probably be fancier in some way. But it’s functional, and here I write my stories and poems and essays. I suppose finally that’s what counts, the output. Right? Why are you sad about your workspace? You know, I have a really beautiful little office. But: I write horror, and so people will always think I’m just some meaningless hack wannabe – people LAUGH at me, and no beautiful office in the world will ever change that. You sit in your supposedly spare little office, and create spectacular fiction that people all over the world read and laud you for, because it’s deserved. There’s no need for an apologia for where you write, or what it looks like. What matters is who writes in it, and what comes out of it. I’ve been thoroughly enjoying Terri’s series. It is such a wonderful, inspiring, and ever-so-slightly illicit thing to peek into the private work-spaces of creative people. Thank you for the further view into yours. Thanks, Livia! I do hope to create a workspace someday that feels different, that feels as though it goes with what I’m creating. But I do love my desks and shelves, and of course I love all my books with a fierce passion. And I hope I’m creating something worthwhile out of all this . . . Thinking of horror as hackwork is silly, considering all the great horror writers, like Poe. Producing the sensation of fear is a significant literary achievement. Lynn, it does feel illicit, doesn’t it? That’s partly what makes it so pleasurable. I love seeing where people like Charles Vess work . 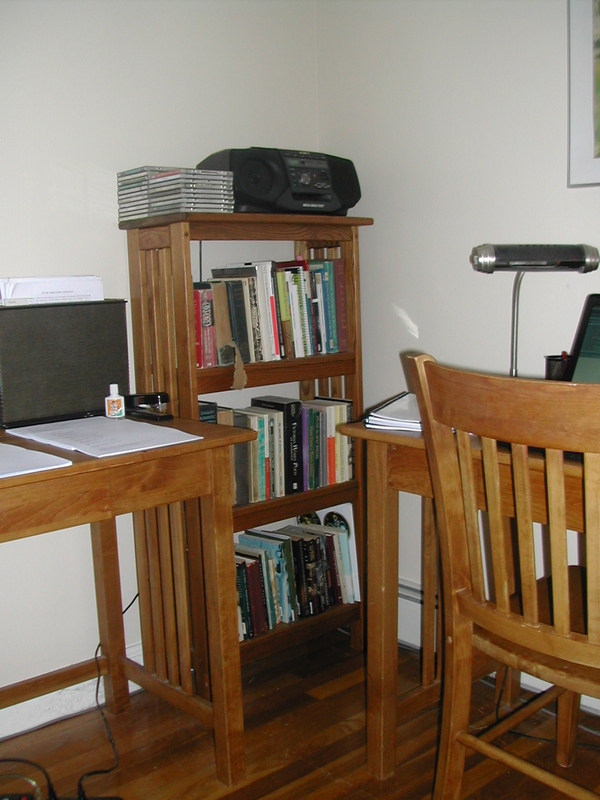 . .
Ah, your writing space isn’t nearly so spare as that initial picture would suggest! I’ve put a link to this post on my blog so folks can get a sense of the full ambiance. Thanks, Terri! It’s still pretty spare, and I do need to hang those pictures up. After all, I bought them some time ago. But all the books do make the space look more lively. I LOVE all the pictures of work spaces you’re posting! They make me dream of what I could create someday . . .